Stated in one national housing trend report, first-time buyers generate up to 47% of all purchases and half of those buyers are under 36 years old. It is now safe to state that many millennials are now taking up a large segment of the home buying procedure. 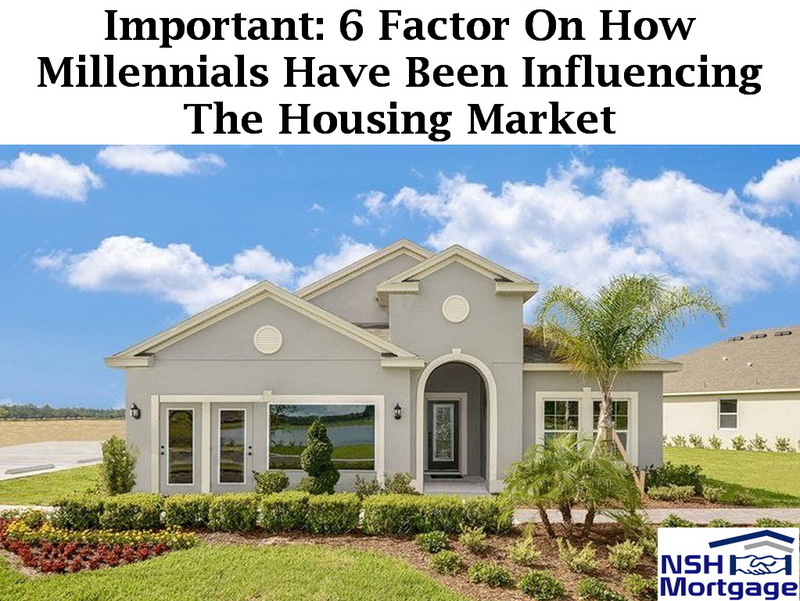 Here is how millennials have been influencing the current housing market. NSH Mortgage has the wisdom and tools that can help in buying a home within the housing market. The Zillow report showed that millennials were the only generation to see an increase in their homeownership from the previous quarter, reaching 35.3%. The report also noted racial differences: 66% of millennial homeowners are white, compared to 77% of all owners. Besides, how do you reach the group that is being discouraged by the idea of real estate buying? Many people believe that owning a home means roadblocks and difficulty. It is not that millennials have abandoned the idea, it just seems hard for them in the long run to manage it all. What Is The Best Way To Educate Gen Y? Firstly, here is the steps on how to have millennials realize that home-ownership can become a real possibility. Even though, they see it as a goal, but they find it not obtainable at this point. It is easy to share the advantages of property ownership, but think about who you are reaching. Your friends, sons, daughters and peers. This group is busy traveling, excelling in their careers and education. How can it appeal to them? One main concern for most millennials are their current student loans. That debt, mixed with a shaky job market causes them a lot of their concern. Those that are in the position to purchase are now finding out that low inventory is another hurdle they have to cross. Although, these are not the only concerns for this generation, that they feel are possible deterrents for them. Millennials remember what happened to the housing bubble in 2008. That made many understandably fearful about buying. Another issue is the belief that only families with kids buy homes, not single people. Although many are considering their pets when they buy, say recent surveys. Lastly, the uncertainty of their careers are a legitimate concern. Millennials go through more job changes more often than any other generation, so that stability is important. That is why renting is such a great option for many, because they have not nailed anything down. Therefore, one point of educating this generation, beside you should not try to force them into an inappropriate housing solution. Work with those who are ready, and that is a bigger percentage of this group every year. For Gen Y, mortgage rates today are very affordable and inviting. If you are ready to buy a home, or even invest in rental property, now might offer the most affordable mortgage rates you will see in a generation. Millennials are not just buying homes at record rates nowadays. According to new data from Ellie Mae, they are also refinancing their existing ones. According to Ellie Mae’s Millennial Tracker, which analyzes monthly closed loan applications from buyers born in 1980 to 1999, refinances made up 14% of all millennials’ closed loans in September. That is the highest refinance share since February. Joe Tyrell, EVP of corporate strategy at Ellie Mae, says the uptick is likely due to low interest rates from previous years. With average interest rates falling to their lowest point in 2017, millennials are taking advantage of refinance opportunities. While we are also observing more millennials with much more purchase power, the uptick in refinances shows maturity among those millennials who previously purchased a home and are looking for an opportunity to lower their monthly interest payments. Though many think of refinancing as reserved for older, more seasoned homeowners, millennials are bucking those stereotypes. The average Millennial who refinanced in September was just 31.5 years old. They also had an average FICO score of 732 and were more likely to be male and married. Another report from Ellie Mae, the Origination Insight Report, show that refinances are not just growing with millennials, though. Refinances have been documented for 38% of all closed loans for September. That is up three percentage points from August. According to Jonathan Corr, Ellie Mae’s CEO and president, low mortgage rates as well as quickening days to close helped improve refinancing across the board. This increase in refinances was most likely due to interest rates on closed loans dipping to 4.21%, the low for 2017. Additionally, time to close a refinance dropped to 40 days as more lenders leverage technology to close loans faster.